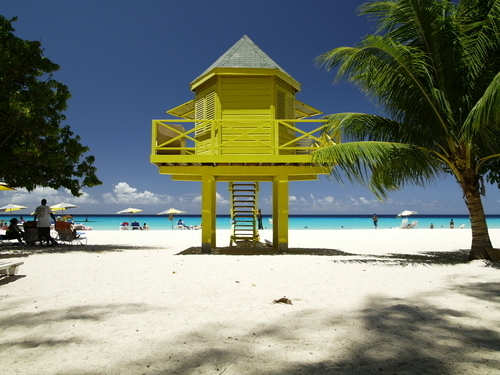 Barbados is blessed with several absolutely stunning beaches. When we're on the island, beach hopping is one of our favorite things to do. Here's our take on a few personal favorites. 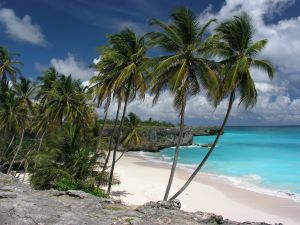 This is by no means a comprehensive guide, but there are several spots here that you shouldn't miss when visiting Barbados... Beach locations can be found on our interactive map page. Bottom Bay: (a 3-5 minute walk) - Well, this is our favorite beach – but we’re just a little bit biased… It's just 200 meters from Hummingbird House. If you venture down the steps to the base of the coral-fossil-lined sea cliffs to reach this isolated cove, a tropical paradise awaits! 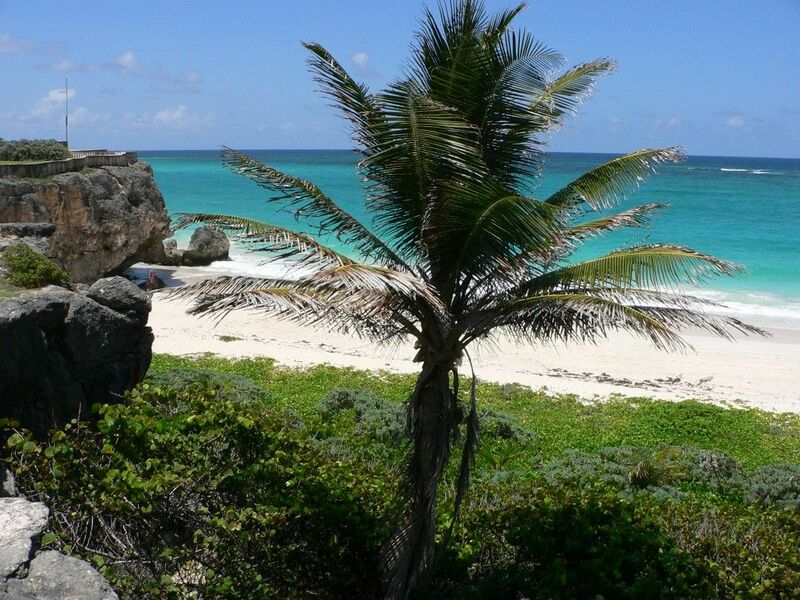 Surrounded by high cliffs, the white sand beach feels like an idyllic hideaway. Swaying palms and aquamarine water make for gorgeous photos. Many times you’ll have the beach to yourself. Be sure to bring snacks and all of the beach supplies that you'll need. There are no shops or vendors at Bottom Bay, except for a friendly rastaman who sometimes sells local conch shells. 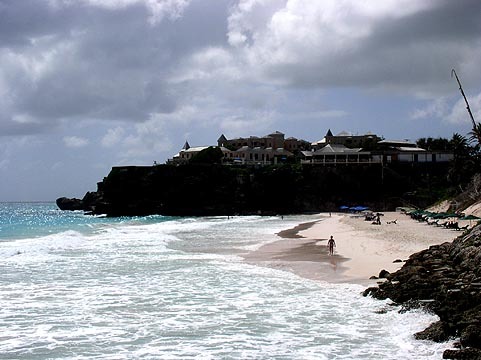 Arguably the most beautiful beach on the island, Bottom Bay beach is featured on several Bajan postcards, and it's the location of the opening scene of Rihanna's recent Barbados Tourist Board advertisement. 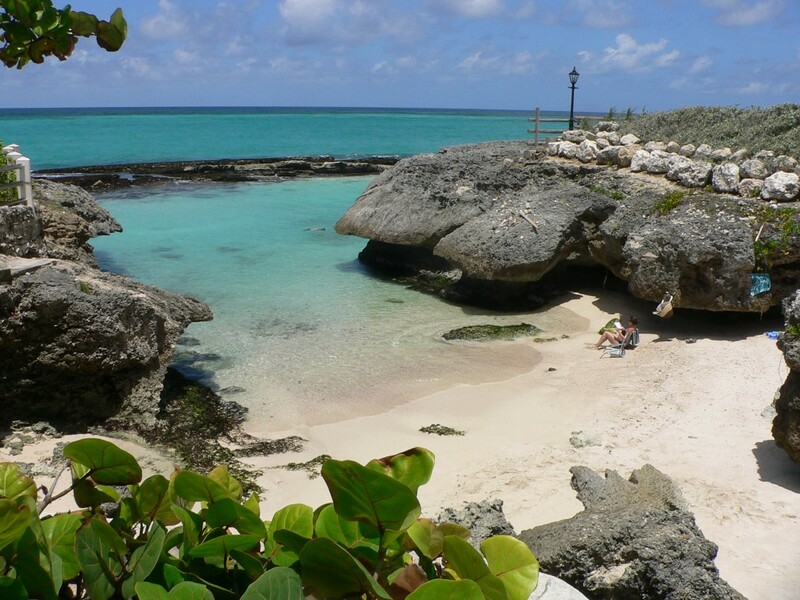 Harrismith Beach: (a 5-7 minute walk) - Harrismith beach, also known as Cave Bay, is an isolated little cove within easy walking distance of Hummingbird House - just below the ruins of the old Harrismith plantation house. There's a natural wave-break just offshore so the water is usually placid (except at high tide) - great if you like taking sea baths in quiet shallow water. Harrismith beach is especially nice for young children who will love finding the sea sponges and sea fans that are abundant on shore, in addition to splashing about in the calm, clear waters. The bottom can be rocky in places, so you may want to wear water shoes to explore those areas. Palmetto Bay: (a 5-7 minute walk) - Very similar to Bottom Bay, but slightly smaller and even more secluded. You will usually have this beach entirely to yourself. Great for a picnic, sunbathing, or a refreshing dip in the surf. 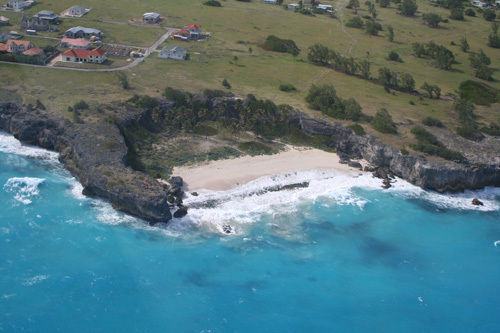 Long Bay: (a 15-20 minute walk) - About 10 minutes walk beyond the Harrismith plantation house is Long Bay beach. This 500 meter strip of white sand is adjacent to Sam Lords Castle. Shark's Hole: (a 3-5 minute drive) - A tiny but breathtaking beach inside a completely sheltered little cove just beyond Sam Lords Castle. Don't let the name scare you off, there aren't any sharks in the tranquil, crystal-clear shallow waters here. If you put on a snorkeling mask and investigate the base of the sea cliffs - where they plunge underwater - you'll be rewarded by seeing large schools of little fish, anemones, big sea urchins, and coral fossils. Ginger Bay: (a 5-7 minute drive) - Adjacent to Crane beach, Ginger Bay beach takes a little detective work to find but it’s so absolutely worth it. 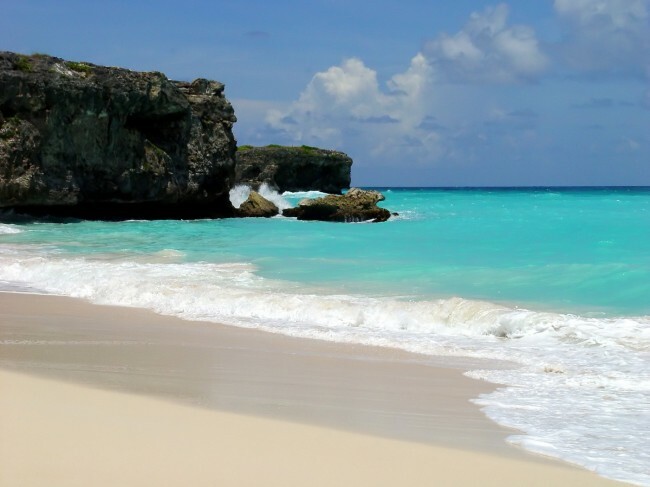 It's our second favorite beach in Barbados. Perhaps even more beautiful than Crane, but often completely deserted. Perfect for sunbathing, boogie boarding, or just taking in the breathtaking scenery. There’s also a cool little cave area to explore. 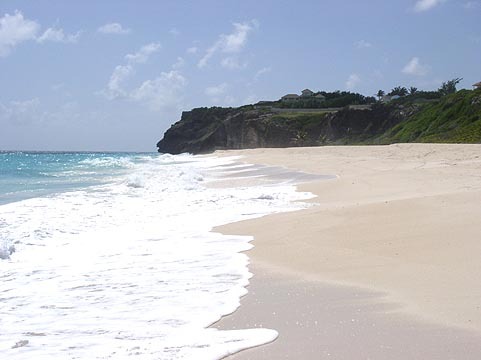 Crane Beach: (5-7 minute drive) - Rated one of the 10 best beaches in the world. This is the perfect sunbather’s beach. 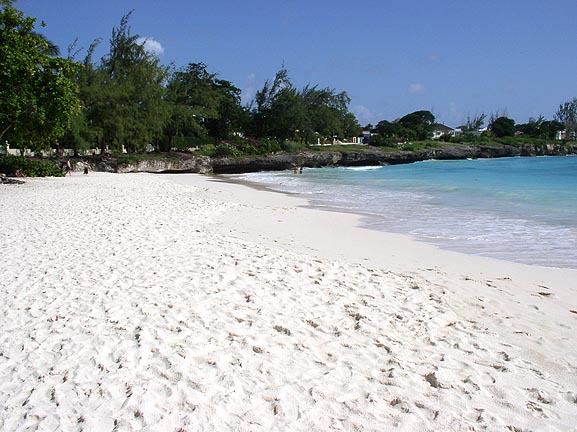 Known for its pink-tinged sand (the color comes from offshore coral), this is perhaps the most famous beach in Barbados. Protected by a natural coral reef, the beach is great for experienced swimmers, boogie boarders or surfers. 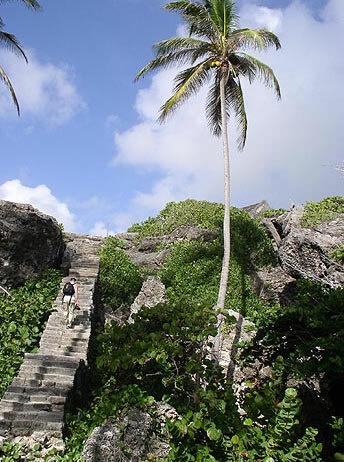 The main access is through the famous Crane hotel (known simply as "the Crane") perched on a high cliff above the beach, however there is public access to the beach just north of the hotel. You can have lunch/drinks at the Crane, or dinner at one of the fine restaurants there. Foul Bay: (a 7-8 minute drive) - Don't let the name scare you off. 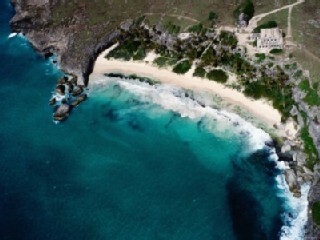 Just beyond the Crane, this 600 meter stretch of white sand beach is set between high sea cliffs. It features a quiet shaded area just behind the beach that runs most of its length. Perfect for a picnic. 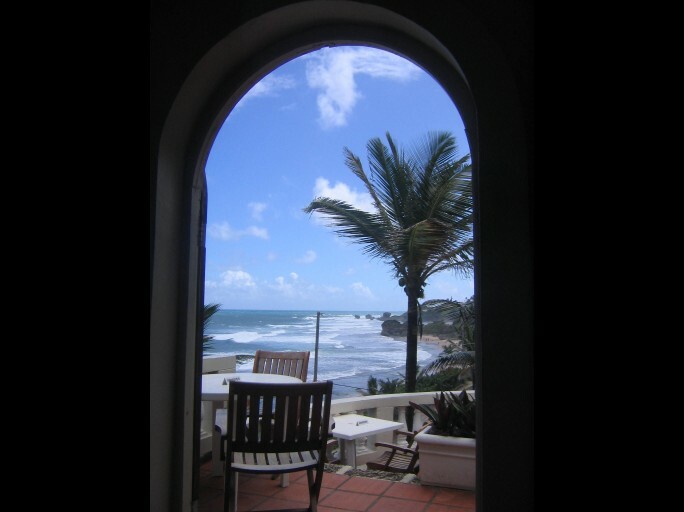 Bathsheba: (a 15 minute drive) - This wild, untamed stretch along the island's Atlantic coast is very different from the typical Barbados beach - but well worth a trip. There's no powder-white sand or turquoise water here, but the giant mushroom-shaped rock formations on the shore (worn away at the bottom by thousand of years of surf exposure) will take your breath away. You can investigate the contents of the rocky tide pools below the Round House restaurant that become exposed at low tide or take a soak in them. 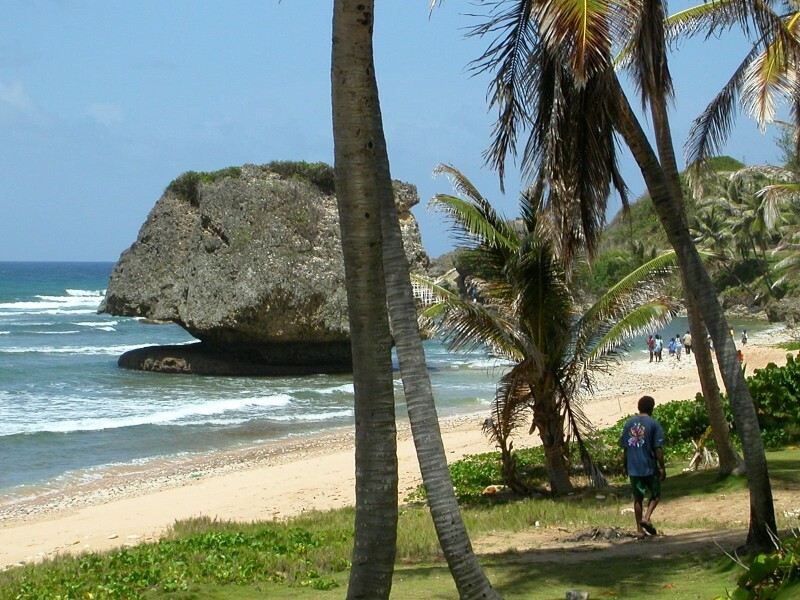 Bathsheba is internationally known for surfing. Each November the Independence Classic Surfing Championship is held here. You can park your car and get snacks at nearby Barclay's Park. We especially recommend the Round House restaurant (the view from which is shown at right) for a great breakfast with a spectacular view - try their delicious herb and cheese omelet and fantastic banana bread. Miami Beach: (a 15 minute drive) - This was one of our favorite beaches growing up. 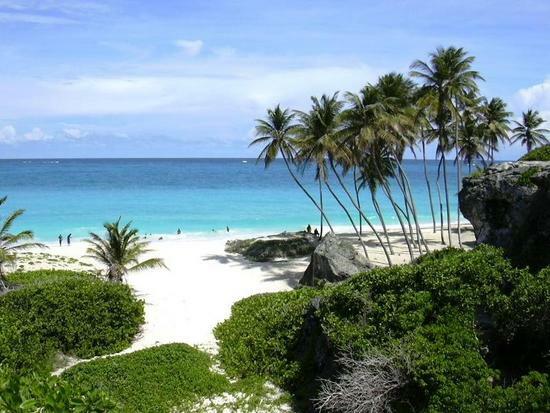 Also known as Enterprise beach, Miami beach in Oistins is popular with both locals and tourists. Somewhat sheltered, the waters are crystalline and clear with medium to small waves most of the year. 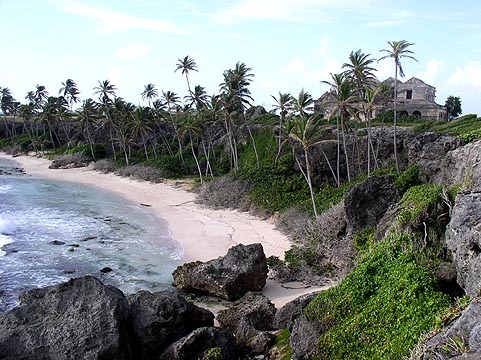 Adventurous sorts can jump off the small sea cliff on the left side of the beach. The smaller right side of the beach bends around a corner - it features tranquil, clear water and is especially popular with small local children. Not to be missed are the freshly-made fishcakes from the "Mr Delicious" food stand – perfect with a cold Banks beer or a coconut punch on a hot day. The Oistins fish market and the nightly fish fry are just a two-minute walk away, and a couple of the vendors are open during the daytime to serve food. Parking is available. 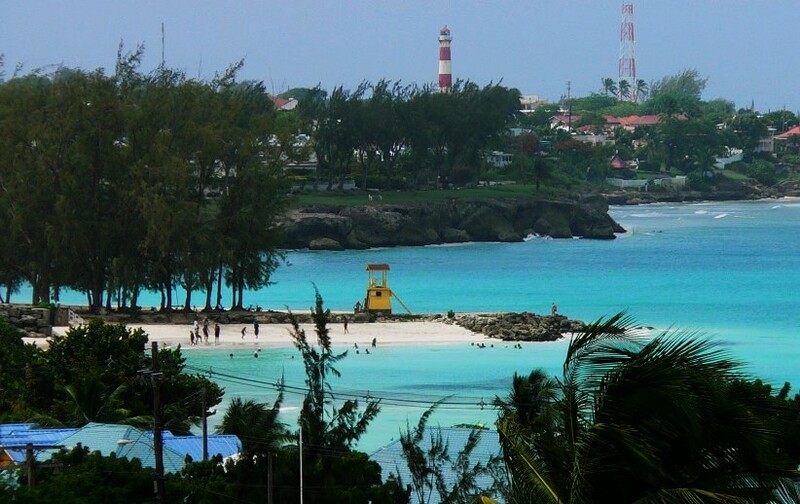 Accra Beach: (a 20 minute drive) - Also known as Rockley beach. 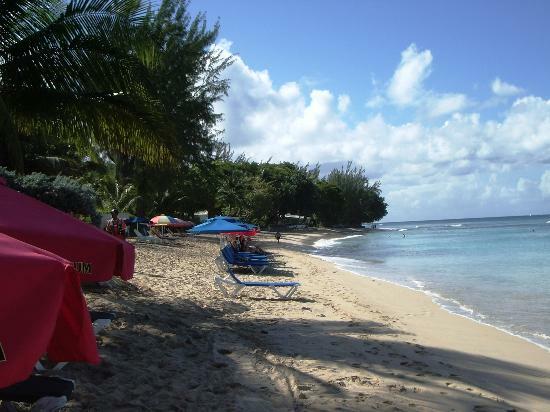 This is a great south coast beach that's busier and more populated than what you'll find in St Philip. Accra is popular with both locals and tourists. 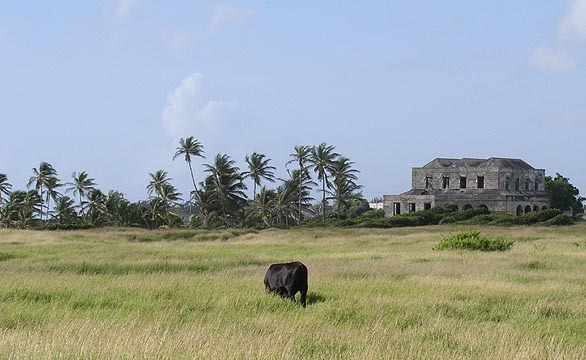 Located on the coast road near Rockley, it features public changing facilities and a parking lot. Snorkeling equipment, beach umbrellas and chairs are usually available for rent. Hungry for a snack? Vendors sell food and handicrafts from booths along the sand, and several restaurants and fastfood establishments are just across the street. For a treat, stop at Flint’s patisserie for lunch or tea. Payne’s Bay: (a 35 minute drive) - Park opposite the Coach House and make the short walk to the soft, sandy beach on this calm bay. It's a great spot for swimmers and snorkeling enthusiasts alike. Food is available from several local pubs and snack shacks. 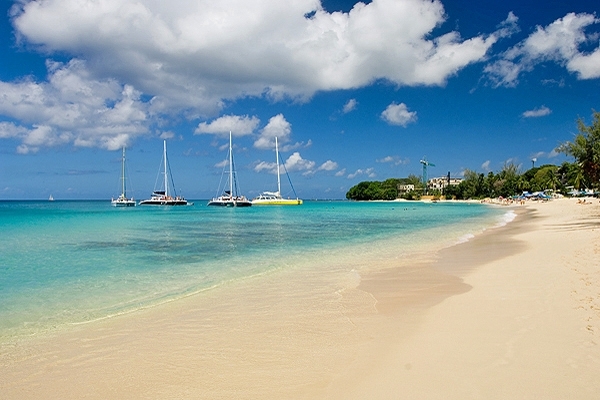 Mullins Beach: (a 35 minute drive) - This beach offers something for everyone. Swimmers will appreciate the calm, lapping waters, while snorkeling enthusiasts will enjoy exploring the area's coral formations. Water skiing and jet skiing are also available. Drinks, snacks and full meals are served at Mannie's Suga Suga, right on the water. Ample parking is provided in a lot across the road from the beach.